Bob Seger has never been shy about looking backward and taking stock. In his early 30s he reminisced about singing a song from 1962. 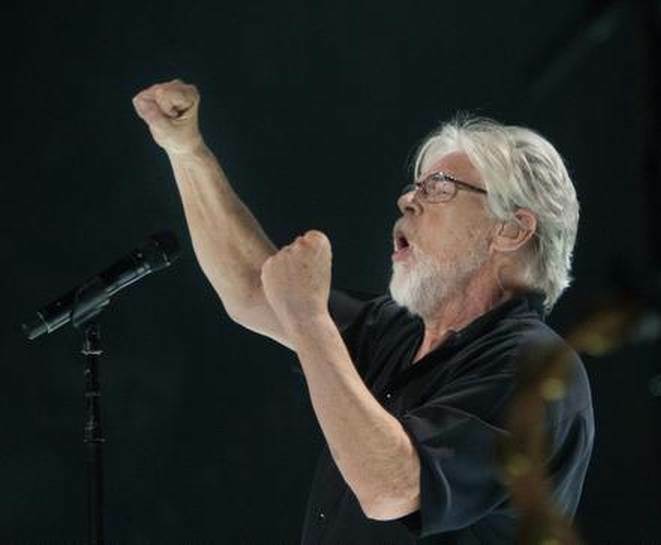 Now on the cusp of his 70th birthday, Seger took Friday night’s crowded Sprint Center on a trip through musical memories that made him a wealthy soul. Dressed in a black button-up shirt, jeans and black headband Seger looked more like someone ready to do yard work than put on a rock show. He performed a few songs sitting down, strumming an acoustic guitar, and a couple of numbers behind the piano, but for the most part he was all over the stage, pumping his fists in the air and leading singalongs — not that the energetic crowd needed any encouragement. When Seger accidentally skipped a verse on “Turn the Page,” the singing masses blindly followed his flub, starting over only when he corrected the mistake. The way the line “Twenty years now/Where’d they go?” reverberated across the lips of everyone in the arena during “Like a Rock” made the song feel a little like a hymn. These days, Seger’s Silver Bullet Band is a small army of more than a dozen musicians, including three female backing vocalists and a four-piece horn section. Although not everyone was on stage at the same time, there were always enough people out front that the stage seemed empty during a pared-down reading of “Against the Wind.” There were eight musicians onstage for that number. It helped that several band members have been playing with Seger for decades. Bass player Chris Campbell came on board in 1969. Horn player Alto Reed joined three years later, and organist Craig Frost was hired in 1979. The music received a few interesting tweaks. Reed’s saxophone replaced the traditional pedal steel on “Mainstreet” and “Night Moves.” Seger played piano and delivered the first half of “We’ve Got Tonight” alone. Although others eventually joined him, the stripped-down setting and sped-up tempo made the performance seem like a demo of the final product and proved the single didn’t need all the gloss and production it was given to reach the radio. In a night full of highlights, the period when Seger left the stage and let his band stretch out during “Travelin’ Man” was the most exciting. McNelley and Jim “Moose” Brown traded guitar licks, giving the song even more punch than the familiar, now nearly 40-year-old live version. On cue, Seger emerged from backstage just in time to start “Beautiful Loser” and take the music in a new direction. The songs have been played together for so long it seems strange that they were originally recorded and sequenced separately. The “Night Moves” album was the crown jewel of the set list. Five of the nine songs from the 1976 classic were performed, including nearly all of the first side. Album cut “The Fire Down Below” doesn’t get much airplay, but the crowd still threw every word back to the stage. Less than two hours after opening the night with “Roll Me Away,” Seger said good night by reminding everyone that “Rock and Roll Never Forgets.” That may be true, but the flip side — remembering — is more fun. Setlist: Roll Me Away/Tryin’ to Live My Life Without You, The Fire Down Below, The Devil’s Right Hand, Mainstreet, Old Time Rock and Roll, It’s Your World, Come to Poppa, Her Strut, Like a Rock, Travelin’ Man/Beautiful Loser, All of the Roads, Hey Gypsy, We’ve Got Tonight, Turn the Page, Ramblin’ Gamblin’ Man. Encore 1: Against the Wind, Hollywood Nights. Encore 2: Night Moves, Rock and Roll Never Forgets.